Mary Emery wanted to create a planned community where people of modest means could escape city crowding and live well. Her dream and her money built Mariemont. 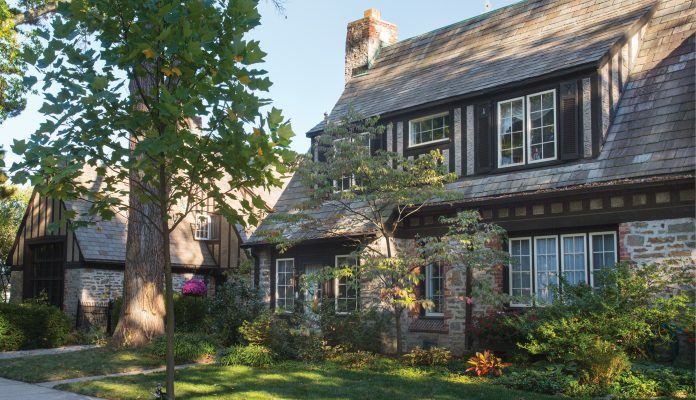 Fast forward 91 years and the modest part may not still apply—the average home sale price in Mariemont last September was well over $500,000, according to MLS data—but much else in this tidy 1923 village, itself a national historic landmark, has been preserved. Case in point: This single family attached home on Sheldon Close, on the market today for $364,500. It’s part of a group of eight timber-stone-and-stucco-frame single family homes, all designed by New York architect Grosvenor Atterbury. Current residents Terry and Carolyn McConville are only the fourth private owners (the house was a rental until 1964). When they bought the place in 1997, some changes had already been made: the front porch had been enclosed, a sizable family room and full bath had been added on the back, and wainscoting and dentil molding had been installed in the living and dining rooms—all 1970s-era attempts, say the McConvilles, at upgrading the place beyond Emery’s original spartan vision. During their tenure, the McConvilles have updated the kitchen, finished most of the lower level, renovated the master bath, and re-landscaped the backyard. Other than the family room addition, every other change made here has been within the home’s original 1,200-square-foot footprint—sort of an architectural miracle considering that other nearby original properties have been demolished in favor of mini McMansions. “We have a neighbor who calls them ‘little fortresses,’ ” says Carolyn. Just another part, we’re sure, of Mary Emery’s master plan.